"I have known Grant Fox of Fox Law Group for over a decade, and I have observed Grant’s professional abilities and have an understanding of what type of character he has. He has stood up on issues that are of importance to us in the pro family movement. When someone is faced with an unpleasant situation and is in need of trial counsel, I would not hesitate to recommend Grant Fox based on his reputation for professionalism, integrity, and simply for the fact that I think he places principle above all other interests." The attorneys of Fox Law Group, PA, work every day to help preserve justice for all by pursuing justice on behalf of individuals who have been injured or wronged. Please contact Jackson accident injury lawyer Grant Fox at Fox Law Group, PA, for experienced representation. When you have been injured or harmed by another person or organization, you have a legal right to be compensated. But rights mean nothing unless they are asserted and exercised. 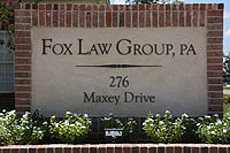 At Fox Law Group, PA, we will protect your rights and pursue your best interests. For a free consultation and case evaluation, please contact attorney Grant Fox at our Tupelo law offices today. From Brandon, Mississippi, the trial lawyer of Fox Law Group, PA, represents clients in Mississippi, Arkansas, and Tennessee, including the cities of Hattiesburg, Jackson, Brandon, Tupelo, MS, and Memphis, TN, as well as residents of Hinds County, Itawamba County, Lee County, Monroe County, Ponto County, Prentiss County, Rankin County, Tippah County, and Union County, Metro Jackson, in Northeast Mississippi, Shelby County, Tennessee, and travelers on I-55, I- 20, and Hwy. 78. © 2017 by Fox Law Group, PA. All rights reserved.